I spent yesterday afternoon dying, lace that is. I love the mottled purple, green, peach.... 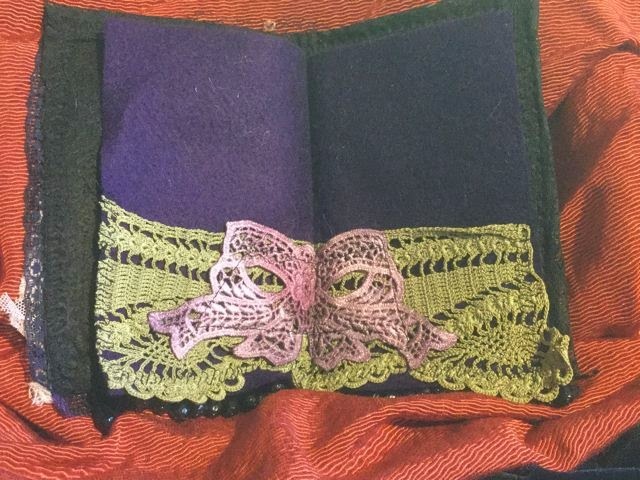 Didn't think to take a picture of all the laces, most of which are now in three of these sachets. This first one was actually the last one I finished yesterday. PS... Please leave a comment. I've missed my blogger friends! 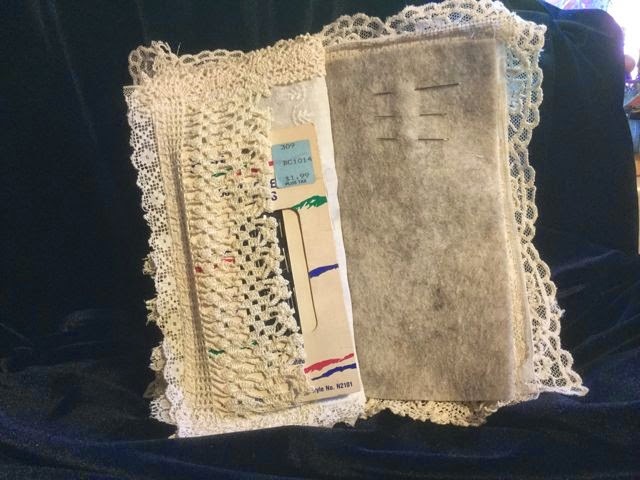 Needle books and Sachets, playing with lace! I had to spend a few days in my studio. Been so busy remodeling our shop Boulder Creek Antiques & Art, my creative muse was getting grouchy! I was so inspired by the gals at PIECEMAKERS, in Costa Mesa! Heather showed me so many interesting embroidery stitches and techniques. 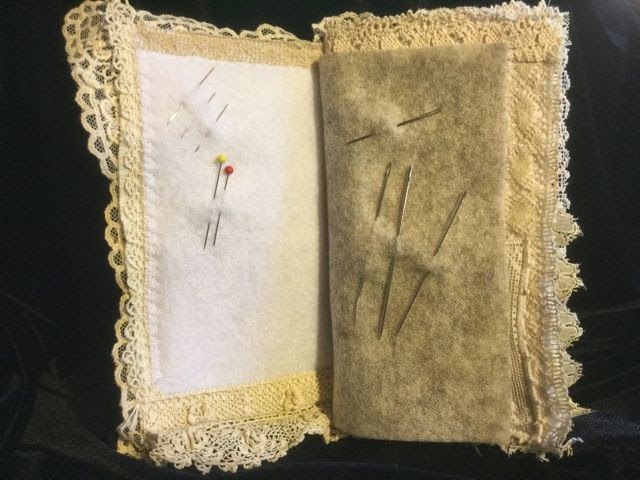 Often, she'd open her beautiful needle keeper. I was so impressed I had to make a few of my own. Of course, all of these are for sale in my Etsy Shop. 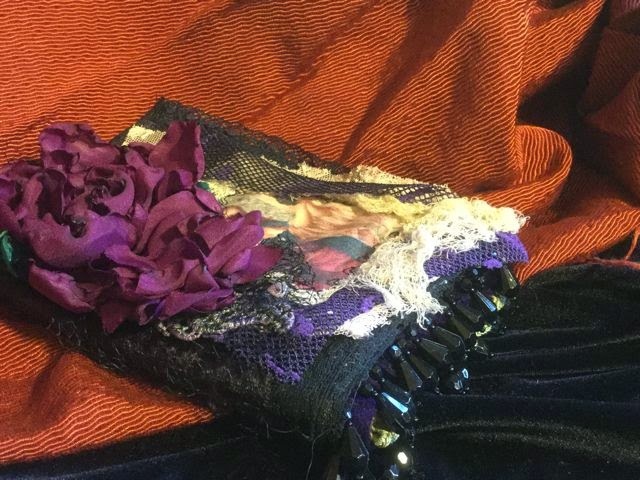 You are drooling over LOTS of vintage laces! 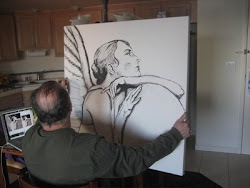 The stone angel is from a photo I took at Holy Cross Cemetery near San Francisco. 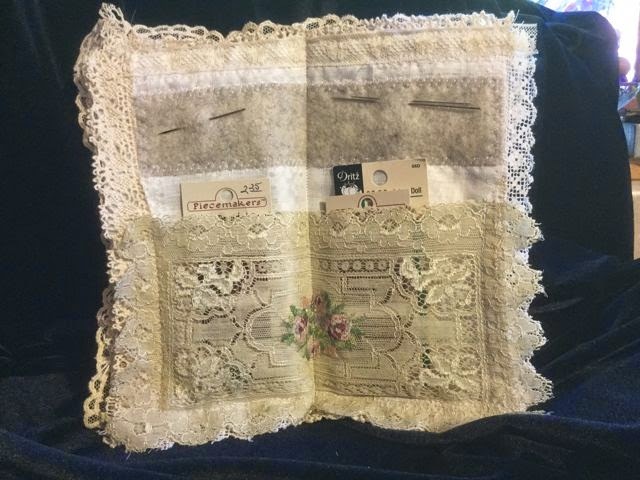 The little lace square is perfect for a pocket. 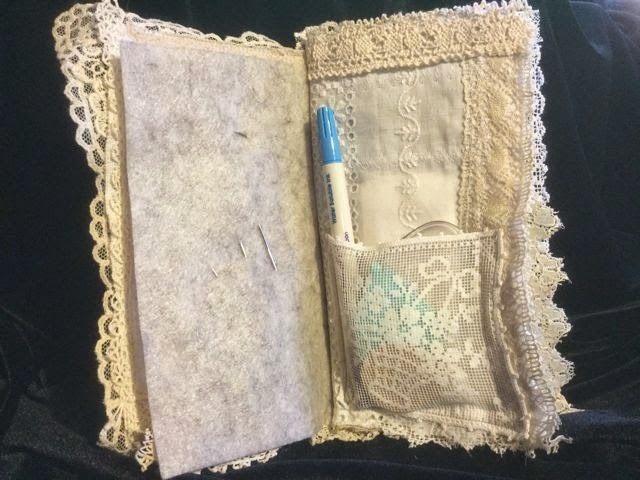 These two pocket are the centerfold of the book, made from a beautiful vintage lace doily. 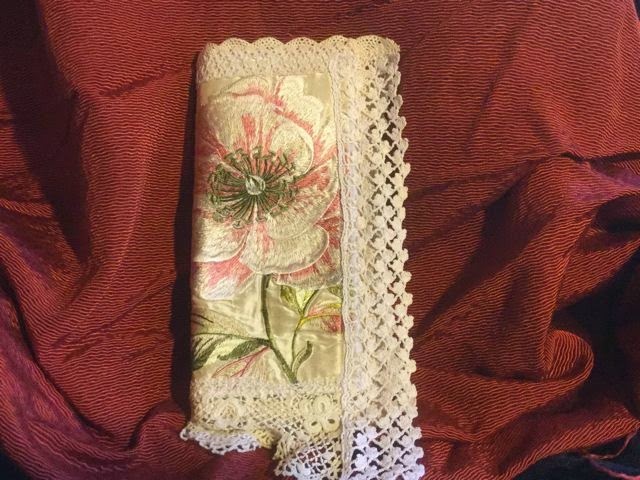 A wide handmade lace makes this pocket. This is a simpler book, adorned with two beautiful plum colored flowers. I loved making these flowers! They are so delicate yet abundant! 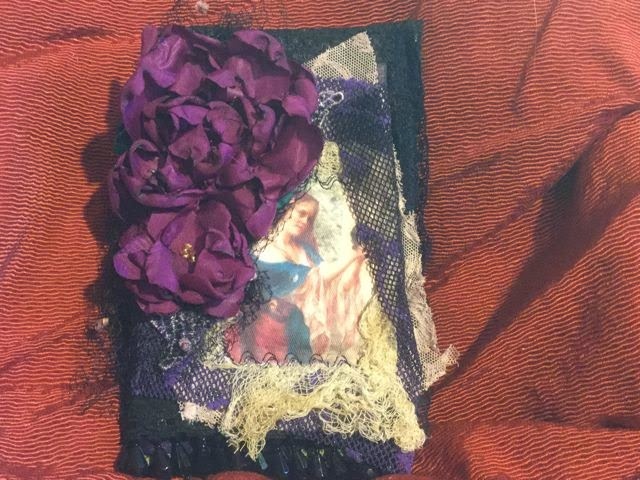 Layers of vintage laces and gauze under this vintage photo printed on twill. 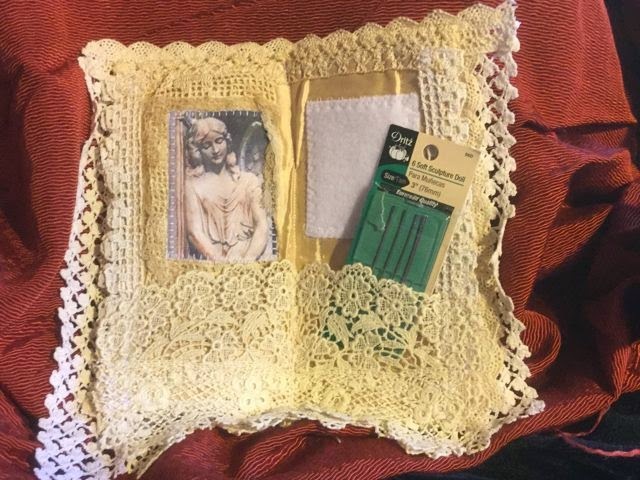 A wide piece of hand dyed green lace form the pockets in the center of this needle book. I love the beaded fringe! The silk embroidered flower on the front of this needle keeper came from an amazing piece of rescued designer fabric I picked up from FABMO.http://www.fabmo.org/fabmo/Home.html Check them out! Such a fabulous concept to upcycle and rescue beautiful textiles! The lace is all handmade... just delicate and beautiful! 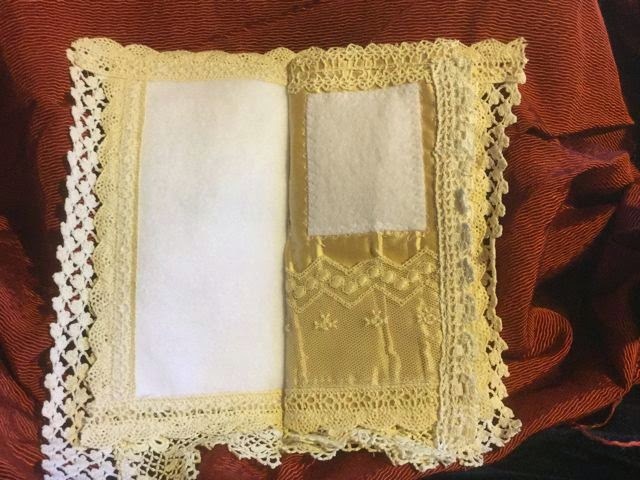 The lacy pocket on the right is an exquisite fine piece of lace. I have maybe a yard of it, so I use it sparingly. But it seemed perfect for here. 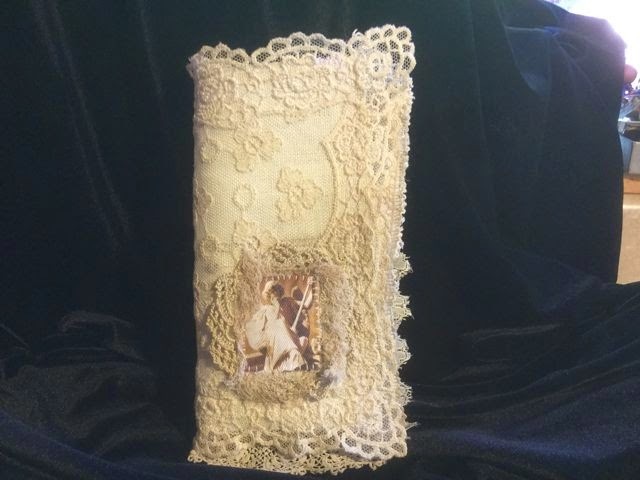 Another stone angel graces the centerfold pockets made from a Victorian lace collar! Under the felt on the right side you can see a peek of some satin designer fabrics, also from FABMO. Now, these four items are all lovely lavender sachets. 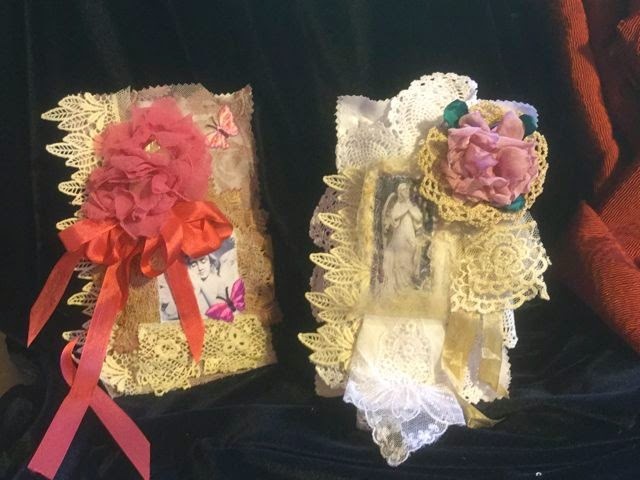 Each one is a mini-collage of laces, flowers, and ribbons. I love playing with silks and satins to make flowers! 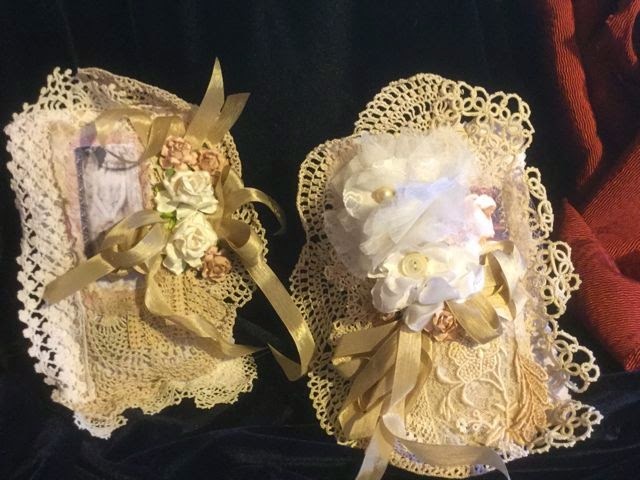 Cut up doilies, vintage buttons, and more and more laces! I'm going to sell these in my store, Boulder Creek Antiques and Art... but I'm willing to sell them here if you're interested. Just let me know which one you want. They are all $16 each.